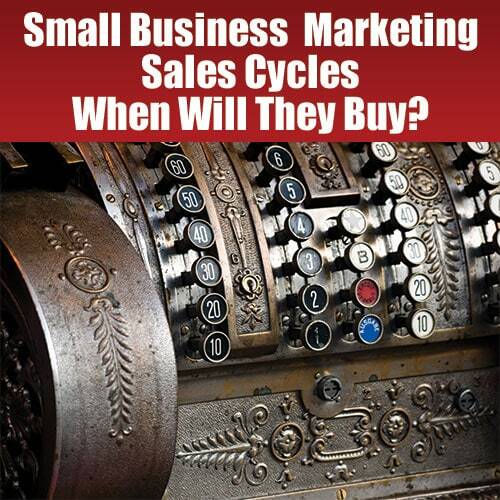 Many of my small business marketing peeps never take the time to really look at and consider sales cycles in their marketing efforts. Today’s post is going to be very important and worth taking the time to read! So what is a sales cycle? Think of it this way, when you are shopping for anything, you have a process you go through that starts with the idea and ends with the purchase. If it is a tiny item like a candy bar, the thought and the purchasing may be very close. If it is a large item or something you need for your business or to help improve your life, the timeline may be considerably longer, with more research involved. Thinking of buying – So you are sitting at your desk and contemplating lunch when suddenly you see an ad for item, OR you are at an event and a speaker talks about something that is new to you and you think, “hmmm that might work for my business”, OR you are talking with a friend and they tell you about this great new product or service they are using. All of these are ways that the IDEA of buying something can come into your head. Early research – Now you know this thing exists and if someone doesn’t sell you that minute on it, you are probably going to do some research on the topic. I heard a great example somewhere about guinea pigs. People rarely buy guinea pigs spontaneously (thank goodness). They see them (or more likely their kids see them), then the parents research how much care and feeding they take, then the kids beg for a while and finally a pig is purchased. There are multiple places in this research phase that you could attract the attention of researchers, have a GP for Dummies Book, offer a free guide to how to pick a long living GP, have a video tutorial about the care and cleaning of a cage. All of these things will get them into your sales pipeline IF you capture their data by asking for their email address and name. Middle research – Okay, the initial discovery had been done and now your customer is moving onto serious research. In this case lets look at a bride. She has become engaged, done some early dreaming about her wedding, but now the rubber hits the road and she needs to find out pricing and availability of venues, where to get her gown and all the other things a bride has to do. As a vendor in the wedding space, you would want to be on this short list. What if, during early research you had offered something like a free wedding checklist that she could use to make sure everything gets done and have continued to send tips her way for the last couple of months? Don’t you think your company will be on that short list? Buying – The research is done and they are ready to buy. This is the sad little place that I see too many of my peeps miss the mark. They are all gung ho up in the research phase and actually convince someone of the value of buying whatever they sell, but then peter out and functionally make the sale for whoever comes along next and talks about it. You HAVE to be in constant contact at this point to make the sale! I have bad news, most of my clients come to me all bright eyed and bushy tailed saying that they only want to target people who are 5 minutes away from buying their product or service. That is a truly admirable goal and sometimes possible by targeting buying keywords in your organic or paid online marketing, but mostly people want to buy from someone they know, like and trust. Let’s say a customer is looking for marketing mentoring and somewhere early in their search they happen along my site. They sign up for my mailing list and I send them great information for weeks or months about how to do their social media, what to look for, etc. By the time they are ready to buy they “know” me. They have seen my videos, they have read my emails, I have helped them to understand what they need to do and what kind of company they need to look for (miraculously close to what I do) and so their buying decision becomes no decision, OF COURSE they hire me because I am the only real choice. The ONLY way to accomplish all these tasks is by using some kind of advanced database (while Constant Contact or Mail Chimp will work early on, they fall apart at the place where you really start tracking and selling…they are a marketing tool, not a sales tool).